Thank you Jozza for this fab bling! I nominate (with apologies if you've received it already): As tagged below: She, Maureen, Linda & Debi, plus also Gill, Mucky Pup & Ana. Leave a message on the blogs you've nominated. Fellow Funky Fairy Lou has tagged me and here's the rules: Each player answers the questions and, at the end of the post, then tags 4 people and posts their names, then goes to their blogs and leaves a comment letting them know that they've been tagged and asking them to read your blog and also to then let the person who tagged you know that you've posted your answers. I had been teaching (geography mostly) for 12 years and was a senior teacher in Wolverhampton, just about to take up being Deputy Head of a secondary school in Gloucester and organising the move. I traveled lots and was always doing something (usually sporty) at weekends. Hadn't even met my husband: Young, free and single in those days! 1: Find the last 'To Do' list - I've buried it under the not done things again! 2: Clean the lounge - DH has removed our old woodburner and there's bits of rust everywhere! 5: Prepare for my sister's visit next week. I rarely 'snack' between meals (polishing halo) but love cheese sandwiches, chocolate & homemade broccoli quiche and any cake except Black Forest Gateau (think halo just slipped off). I'd get the renovations of this house finished and probably buy another with more space and that is more environmentally friendly (we don't even have a washing machine yet but do have solar panels). I'd probably hire a gardener to help with growing the veg and someone to help with the loathed housework too! I'd also try to do some good for others for whom even having our little house and any veg patch is luxury. UK: Birmingham, London (Kingston, Wimbledon, Central & Croydon) for 10 years, back to Birmingham, Gloucester, and then moved to France (Brittany) nearly 2 years ago. 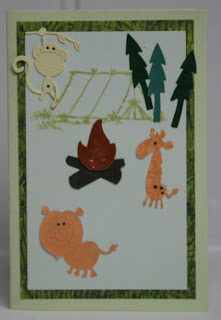 My son Jack, age 7, has made a card for a kids blog at Crafty Monkeys where the challenge was wild animals. He loves using the Cuttlebug so he immediately went for those animals and other bits and asked for "a tent stamp and the green ink" (I happened to be using Shabby Shutters Distress Ink at the time!). I cut his requested card and paper on the guillotine and he did everything else himself. 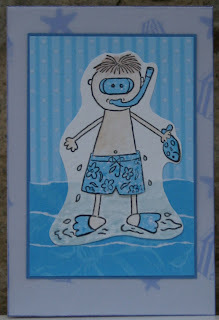 There is also a new kids challenge blog at Tiny Funky Fairys & Elves so if you have crafty kids it's worth noting! 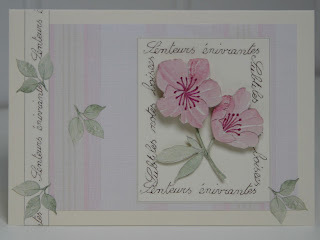 Just time to sneak in the challenge set on Sunday Stampers last week: 'With a little help from my friends'. The relevance here is more the sentiment than the stamping as that is the only thing I have stamped. I have made the card for my French tutor as the course finishes tomorrow. The class has had a collection to buy her something nice and I said I would make a card. She has admired the decoupage I have made in lunch breaks and for requests by classmates so I think she'll like this. The friends made on the course, of lots of different nationalities, has been brilliant as we have supported each other in our progress and cheered our successes. Our tutor has met all our differing needs expertly so we really are very grateful to her. I have a long way to go to be bi-lingual but I have made a lot of progress in the last 4 months. 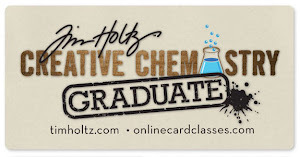 Cartes Maniak 58 & Oh Baby ! 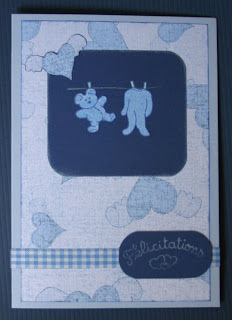 This card is a combination of the Cartes Maniak sketch this week and the theme being 'Oh Baby' on TGiF. Funky Fairy prize up for grabs !!! Isn't she a babe?! I love her! There's going to be a new stamp previewed each week with a random draw to win the stamp: All you have to do is create something on the same theme. And there's an opportunity to join the DT and/or be a designer...See here. Firstly, a few weeks ago I made a photo album completely from scratch.I have the inner pages on order (the good old fashioned ones with interleaving) but I have now made the box to house it, which I'm relieved to say fits like a glove! It is quite sturdy as it was reinforced and reinforced before being covered in Scivertex. 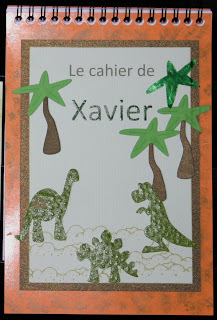 Secondly, I decorated the front of a note book to match the dinosaur card posted a few days ago. A little thank you present which I think will be useful. I stuck everything down flat this time, which I wouldn't normally do, but I want it to last. I used the Cuttlekids dies with skivertex and paper pieces again and matched the backing and stamping to the card and, before all that, I put a few drops of the diluting spirit on a bit of sponge and used that with a few drops of 'Bottle' green alcohol ink on the cover of the book. Also glossed the printed name with a Sakura glaze pen. 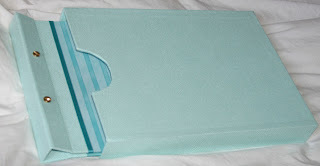 I shall be offering blog candy myself next week but I'm not telling you why just yet...but please check back! In the meantime, Jacqueline is offering candy here to celebrate 10000 + hits - Well done Jacqueline ! Hommage to Converse Baseball boots ! 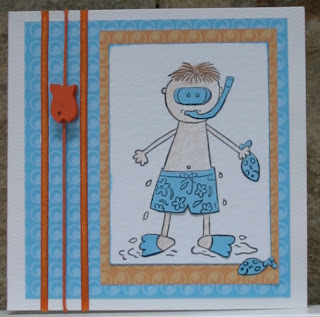 I'm flattered to get card requests but seem to end up making some very strange cards! 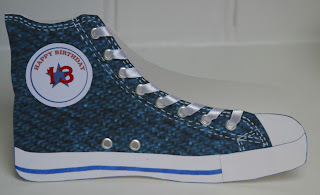 When a friend asked for a 13th birthday card for her daughter and said she was in to 'Converse' it took me back down memory lane remembering I had a similar pair of much-loved baseball boots at that age. So I used a googled image as a basic template and layered up paper and card to create a similar boot. I have embossed the front piece in similar fashion (don't know if that shows in the photo), added the eyelets and ribbon and used white Sakura soufflé for the faux stitching. That seemed to show better than gel pen - I tried both - although it is clear as it goes down. Hope she likes it! 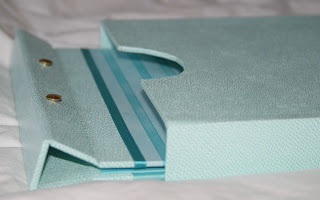 This week's Funky Fairy Challenge is to make something using a Paper Piecing technique, but what is that??? The Design Team had different ideas so I'd really encourage you to have a look and see what we all made and we'd love to see your interpretation. I went for using stamping on to paper which was then layered over the original stamped image and did 2 variations of this, the first using Funky Fairy Blues with a printed vellum background and the second (spot the extra fish!) using Cool Co-ordinates. I could have used a flesh coloured paper for the boy and had a no paint/colouring option but opted to use pearly paints on my base layer both times. Needed a thank you card for a guy (nursery teacher) who loves dinosaurs so I used the Cuttlekids dinosaurs dies and had fun creating this one: Used the surround of one dino to sponge distress ink (faded burlap) on to the card for the background and stamped the foreground. 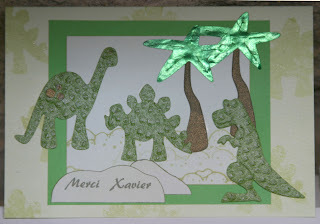 Used some green skivertex for the dinos and scraps of other papers for their features, trees and the 'rocks'. Some of it is mounted with 3D foam but the photo seems to make it look flat. Han set this week's Funky Fairy Challenge: The challenge this week is to use something edible on your project this can be a stamp, sticker, paper with images of food/ drinks etc. I have used the Funky Fairy Birthday Kit for this card: I love the cake and the ice cream colours of the papers, frames and images . I added an extra layer to 3D the cake and glazed the dots, candles and flames for added definition and finished off with some gems dotted about. 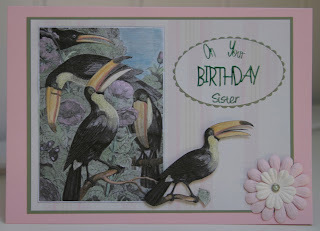 This week's Cartes Maniak challenge is to make a card where one of the main colours is green so I have made this birthday card for my toucan-loving sister-in-law. I painted a printed B&W image with pearly paints and layered up an extra bird for 3D effect. Cette semaine le challenge ‘Cartes Maniak’ est faire une carte dont une des couleurs principales sera la couleur verte, donc j’ai fait cette carte avec des toucans pour l’anniversaire de ma belle-sœur qui adore ces oiseaux. J’ai fait la peinture d’une image imprimé et ajouté un oiseau de plus en relief 3D. Jozza's celebrating 5000+ hits with candy HERE. Congrats Jozza! 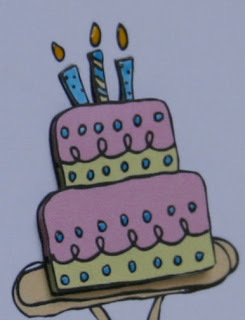 expires midnight 18th June BST; winners announced on 19th. Tri, Tri and Tri again!!! So, in a bit of a departure from the norm, I've combined 3 trees, 3 triangles and 3 tents for a camping theme! 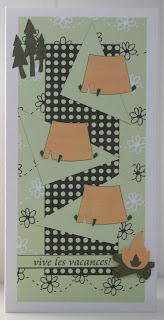 Used Funky Fairy green Meadow and orange Cool Co-ordinates papers with Cuttlebug dies. 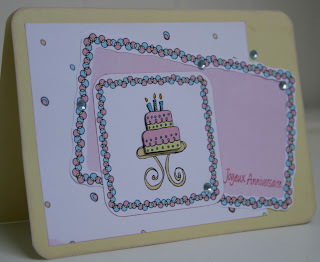 SBS 13 sister Jo on 'Only Joking' has lots to celebrate and has requested cards that are 'pretty and pink' to enter her blog candy draw. I've made these two today: Hope you like them Jo ! 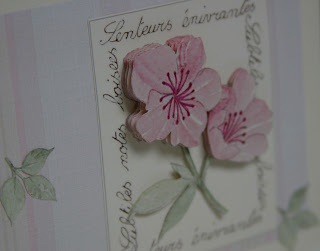 Stamped images on top card are 'Stampin Up' with Brilliance Pearlescent Orchid; paper on both cards from K&Co. "Just make something, anything (!! ), which features buttons and beads and lets see how creative we can all be... but why stick at one thing? !" 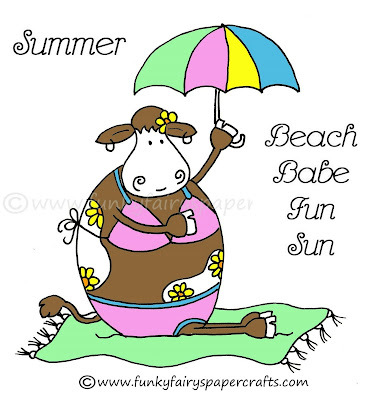 Here's my card for this challenge: You don't have to use Funky Fairy products to enter and, as always, a random winner will receive a free download of their choice from Funky Fairy Papercrafts just for entering. 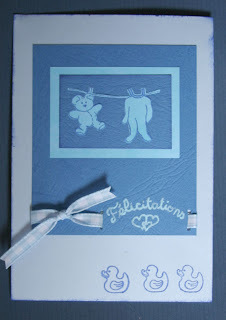 I have used Doodlementals which is a free download kit on the Funky Fairy Inspirations Blog. 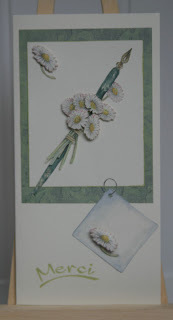 It is packed with papers and toppers so well worth getting. I have added leaf-shaped buttons on wire stems and sequins and beads to the layered flower centres.